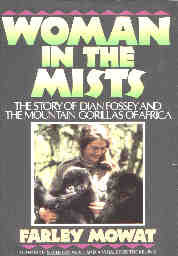 In Woman in the Mists Farley reprises Never Cry Wolf, but this time the main character is Dian Fossey and the companion animals are gorillas, mountain gorillas in the wilds of the Varunga Mountains. Like Farley, who came to love and understand wolves, Dian came to love and understand the mountain gorillas. She called on her work with autistic patients for new strategies for habituating gorillas to humans. After months of work, she was able to make physical contact with the gorillas, becoming an adopted member of the group -- playing, wrestling, hugging, cooing, chest-beating, and even given to long, thoughtful staring when a favorite gorilla named Tiger was suffering from chest wounds. The gorilla scenes are touching and made me yearn for a world in which such majestic animals would be allowed to live in peace.